The table below lists the NaturalDocs syntax that DVT recognizes. For more details see http://www.naturaldocs.org. <LinkAddress> Inserts an in-line link with visible text label that points to the documentation for the specified package, class or member name of a referenced class. This tag is valid in all doc comments. For more details see below. ~Italic Text~ Use tilda (~) for Italic Text. *Bold Text* Use star (*) for Bold Text. Headings You can add headings to your output just by ending a line with a colon and having a blank line above it. 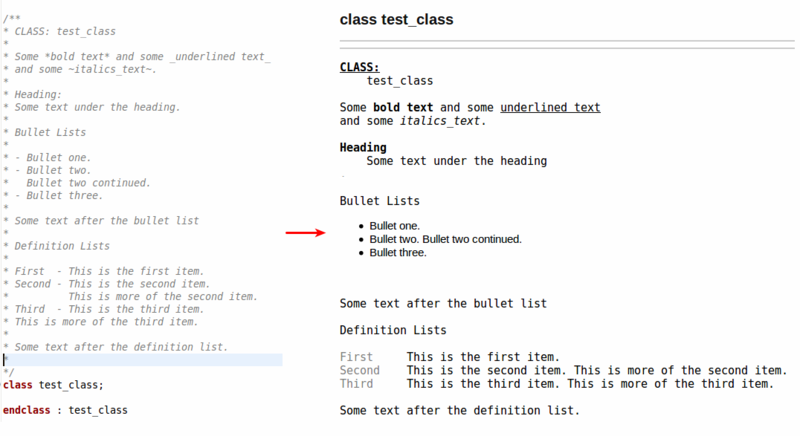 Bullet Lists You can add bullet lists by starting a line with a dash, an asterisk, an o, or a plus. Bullets can have blank lines between them if you want, and subsequent lines don’t have to be indented. You end a list by skipping a line and doing something else. Definition Lists You can add a definition list by using the format below, specifically “text space dash space text”. Like bullet lists, you can have blank lines between them if you want, subsequent lines don’t have to be indented, and you end the list by skipping a line and doing something else. Images You can include images in your documentation by writing (see filename). If you put it alone on a line it will be embedded in place. Code and Text Diagrams , or :'''. If you have a vertical line or text box with the comment, you must separate these symbols from it with a space. Internal Links -> point to data inside Documentation. In this case LINK_ADDRESS must respect the following notation: Package_Name::Class_Name.Method_Name for an absolute path or TYPE_NAME.INNER_TYPE_NAME or just TYPE_NAME for relative paths. In case of a relative path a link will be created to the best match for that type with regard to its scope inside the project. NOTE: Using relative paths could generate broken links if there are different data types with the same name inside the project! For both types of links LINK_TEXT is optional and it can be used to show a user defined text instead of link's path.